AMMONNEWS - Prime Minister Omar Razzaz on Wednesday laid the foundation stone of the new Maan Military Hospital which will be implemented under a Royal Makruma at a total cost of JD35 million. 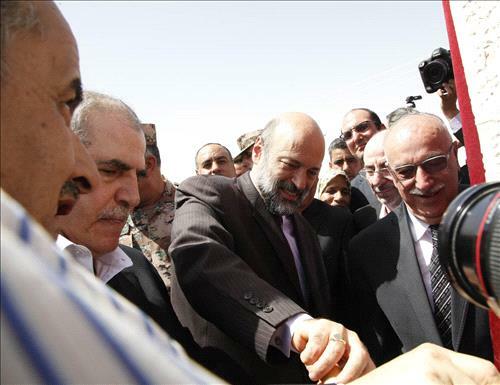 Razzaz unveiled the plaque of the project in the presence of Royal Court Chief and head of the follow-up committee for the implementation of Royal initiatives Yousef Issawi, Minister of Public Works and Housing Yahia Kasabi, Minister of Health Mahmoud Al Shayyab, Chairman of the Joint Chiefs of Staff Lt. General Mahmoud Freihat, MPs and senators of Maan Governorate, the director of the Royal Medical Services and other officials. In remarks during the ceremony, the prime minister said that the establishment of the hospital comes in fulfillment of pledges made by His Majesty King Abdullah II to the citizens of Maan, adding that the project will contribute to raising the level of health services provided to citizens, and alleviating their suffering. "Providing services to citizens in various fields is a duty of the government," he said, adding that the government has a duty to distribute these services fairly and alleviate the burden on the poor and middle income groups. The prime minister pointed out that the government pledged in its policy statement to raise the level of basic services in the sectors of education, health, transport and water, and to provide a clear plan to improve these services. He said that this project will not be the only one in Maan, adding that the Cabinet approved the Maan land port which will be one of the most important development projects in the governorate. Razzaz said that the 150-bed hospital will require creating 600 job opportunities to ensure better services to citizens. In response to comments made by head of the decentralization council in Maan Governorate, he said that when His Majesty ordered the implementation of the decentralization project, he wanted genuine development, noting that municipalities play their role in achieving development. Minister of Public Works and Housing Yahia Kasabi said the ministry is working in coordination with the Royal Court to carry out Royal initiatives that covers sectors including health, education, sports, youth, woman and child, people with special needs as well as the poor.